I have made a fair share of cheesecakes but it must be said that they can be extremely fickle. They can collapse if a no-bake, crack, or fail to rise if baked. Okay, when it doesn't turn out the way I planned, then I just throw it in a bowl and serve it, but ponder on what might have gone wrong. When doing something, I like to do it well. 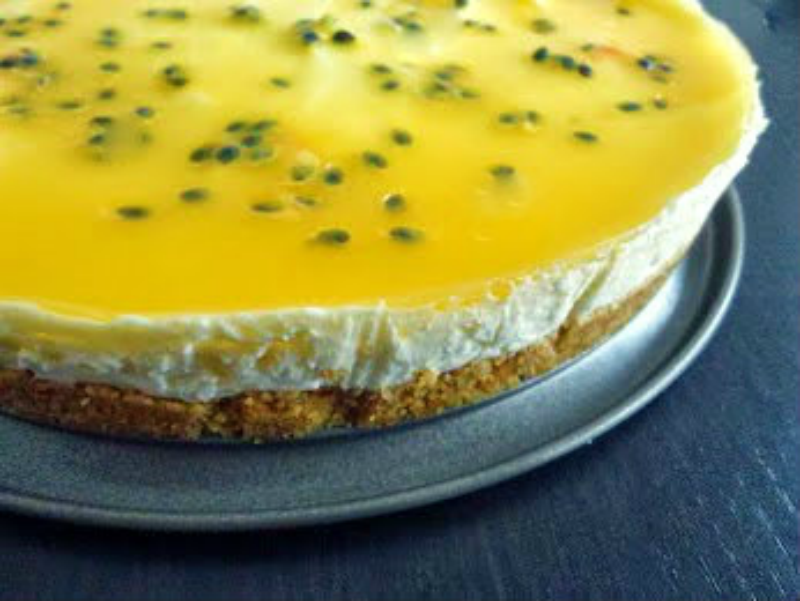 This great no-bake cheesecake went very well indeed, and the passion fruit glaze is the real icing on the cake. 1. Crush the biscuits in a blender or food processor, or by putting them in a self-seal bag and crush them with a rolling pin. 2. Melt the butter in a large saucepan. Tip the biscuit crumbs into the butter and mix well until thoroughly combined. Press the buttery crumbs into the bottom of a 9 inch spring-form or loose-bottomed tin. Chill in the refrigerator to set. 3. Combine the whipping cream, cream cheese and mascarpone in a large mixing bowl. Using an electric handheld mixer or a fork, blend the cheeses together until light and fluffy. Add the caster sugar a little at a time and blend to incorporate. Finally, add the vanilla extract. Continue to blend until velvety. 4. Spread the cream cheese mixture over the biscuit base and smooth the top with a palette knife or spatula. Chill in the fridge for at least four hours. 7. Push the passionfruit pulp with a large spoon through a sieve until all the juice is extracted, reserving the seeds. 10. Add the seeds to the passionfruit glaze. 11. Very gently pour glaze over cheesecake, cover with clingfilm and return to the fridge until glaze has set.